The Lamina Atlas LEDs are rated with an absolute maximum current of 700mA per color, though all output specifications are measured at 350mA. 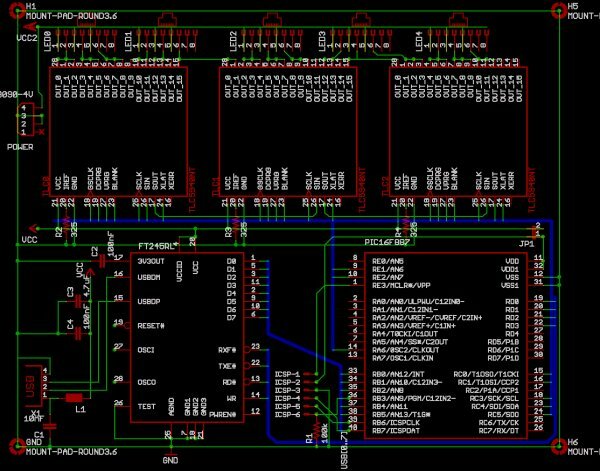 To simplify the number of components, this design uses three TLC5940 outputs in parallel per LED color, achieving 360mA (3x120mA). It is now my understanding that these LEDs are well-rated for 500mA use, but I’ll likely switch to separate amplification for such an increase rather than adding further TLC5940 chips. I’ve etched only with a single-layer board, with wires on the top layer. If a double-layer board were to be used, a few crossed traces on the top layer would need to be re-routed. Only after etching this board did I obtain a Pickit 2 programmer. This programmer allows in circuit debugging, but I had used the ICD pins, RB6 and RB7, for data communications. If RD6 and RD7 are substituted for RB6 and RB7 on the PCB, an ICD can be used. Search on ICD hack in main.c With a little effort in Eagle, PORTD should be substituted for PORTB. 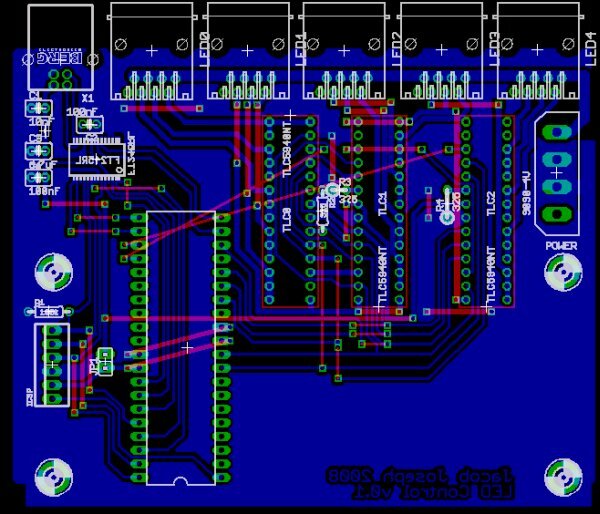 Myself, I’ll get around to this when I need another PCB.